I was telling my husband, I think I've learned more about history from historical fiction than from real history classes. Facts and figures don't have nearly as much staying power as 'real' characters do for me. Which leads me to the next great book I ready this year. The Nightingale by Kristin Hannah tells the story of Vianne during World War II. Vianne was a French woman in a small rural town with (originally) a very useful airstrip. 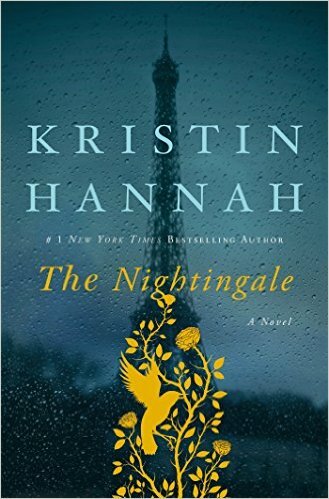 When France surrenders to Germany, Vianne is left to negotiate German occupation as a single mom, a sister, a friend, and a daughter - with several roles meaning something different than she ever dreamed. We also hear the viewpoint of Vianne's sister, Isabelle. A rebel all her life, the war gives Isabelle a true purpose, and a focus for all her fighting. I would definitely recommend this book, but be ready to cry as you hear how the experience of war and living through the war influenced and changed Vianne, her neighbors and children, Isobelle and those she worked with, the girls' father, and so many others. It's a book about the war, but even more about how the characters lived through it, or died trying. I have this book from NetGalley to read but haven't gotten around to it yet :) sounds great though! Thanks for the review. I pretty sure I've read this book. In fact I think I made the mistake of buying it twice. LOL.